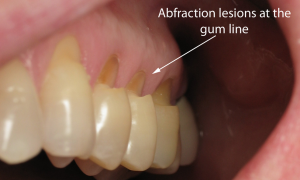 What is Bruxism? Bruxism, also known as grinding or clenching of the teeth, is a condition that mainly impacts you in your sleep causing long term damage to your teeth, gums, and bone. We can also grind when we are awake, but the majority of the impact is during your sleep. The muscles have memory and will continue to grind at an even more significant rate while you sleep. What are the signs that you may be a grinder? 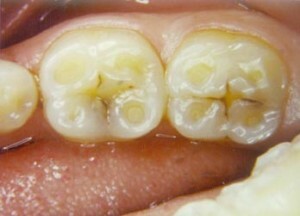 The photos above show some of the signs of bruxism. 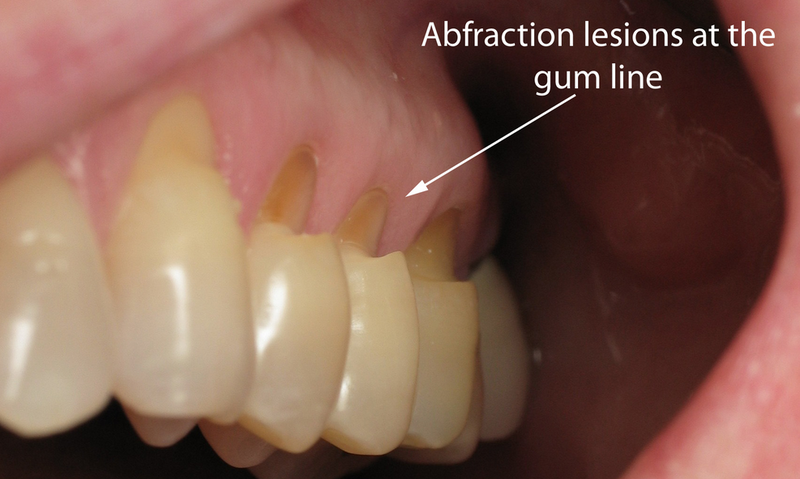 Breaking away of the tooth surface at the gum line (abfraction). Can it be prevented? Not really. There’s no true solution to preventing or stopping bruxism. Some tips to help reduce or alleviate some of the symptoms are as follows. One of the best options if you are a heavy grinder is to wear a night guard to protect your teeth while you sleep. Some people even choose to wear them during the day when they are working or concentrating due to the fact that they grind or clench during these types of situations. Night guards can be a great solution for someone who grinds heavily while sleeping, has sleep apnea, or has a lot of stress in their life. What should you do if you have some of these signs? Give us a call today and come in for an appointment. We would love to take care of you! We can get you set up with a custom made night guard or look at other options that are right for you and your condition. We hope to hear from you soon.